‘Supreme Whispers’ is the kind of book that is really hard to review. This is because the book is a result of efforts of two different people at two different points in time. George H. Gadbois Jr., a scholar of Indian law and judicial behaviour, conducted over 116 interviews with more than sixty-six judges of the Supreme Court of India, and others like senior lawyers, politicians, relatives of deceased judges and court staff. Gadbois made meticulous records of these interviews in his handwritten notes which he later typed out on a typewriter. Before passing away, he sent these notes to Abhinav Chandrachud, his student and the book’s author, after he had himself extracted a book out of them. The present book is justified by the author citing the fact that he had been granted full freedom towards the use of Gadbois’ notes by the man himself, and that Gadbois’ book barely scratched the surface on a few important details, perhaps due to the time period that it had been written in. It is with these things in mind that Abhinav Chandrachud fashions a rather interesting book out of Gadbois’ notes but since we are not exposed to the full catalogue of the original content we have to depend on the author’s discretion and direction in choosing and arranging the material. Before getting to the book itself, I must confess my surprise that such a book exists. 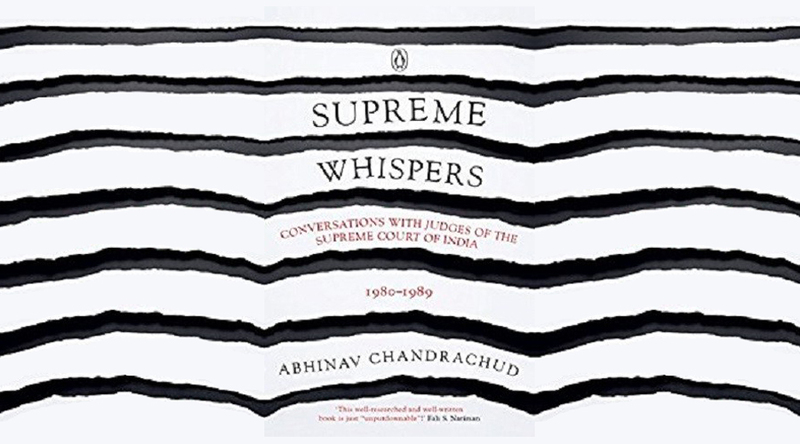 The details of the judges’ conversation given in the book are quite astonishing and often so personal as to leave one wondering about the frankness exercised by the eminent justices and others during the interview, something that even the interviewer noted at times. He thought it very naive of Mrs. Roy to tell him about Prime Minister Indira Gandhi having asked her husband Justice S.C. Roy to take care of some legal work concerning her family property and having the files whisked away after his death in office. The book notes that besides high regard for his scholarship, at least some interviewees were motivated to meet Gadbois for the interview because they thought of him as a useful contact in the U.S. Some asked for his help in obtaining foreign reading material, some asked for help in sending their children to the U.S., some thought he could help them get a professorship or lectureship there. Though based on interview notes, the book has not been reduced to simply being a directory of who said what. The author deserves credit for neatly organizing the mass of notes into a readable whole and could not have come up at a better time. Unlike the nitty-gritty of party politics, which is forever the subject of discussion on Indian news channels, the general public does not normally seem to care much about the happenings in the judiciary. Courts make rare appearance in public eyes and that too only as the final deliverers from the corruption of politicians. An air of mysticism surrounds the whole judicial process in the country, including everything from basic litigation process itself, the opaque handling of Public Interest Litigations (PILs), to the appointment of the judges themselves. Due to intense activity in the courts recently on matters such as Sabarimala, Aadhar, Shri Ram Janmabhoomi case, the judicial process has come back into the public spotlight after a very long time. It is in such a situation that books like the one at hand have become quite important, because even a cursory reading of the legal history of the judicial system in India is enough to put a lot of myth-making around the courts to rest. The very first chapter of the book shatters the image of the Supreme Court as a body of consensus. It goes into details of various rivalries, jealousies and tensions between judges of the Supreme Court over matters of ideology or more often, over quite personal matters, as recorded by Gadbois. The chapter records the tradition of bitter rivalry between the chief justice of India and the most senior judge after him by naming and going into details of eight such pairs, including the author’s grandfather, the late Justice Y.V. Chandrachud. This is contrasted in the second chapter with the puzzling lack of dissent observed in the Supreme Court, one of the many reasons for which is that the overworked SC judges simply don’t have enough time to write dissenting judgements. The ever-relevant question of the ideological stances that judges adopt is also discussed at some length in the first chapter. Justice R.S. Pathak is quoted to have remarked that there were broadly three distinct groups of judges in the court at the time: first, the legalists who only looked at the law, secondly, the centrists, who were open to change within the confines of law and constitution. The third group comprised of judges who considered themselves to be lawmakers. Activist judges like these who believed in the idea of a living constitution interpreted it in a manner that went beyond what the framers of the constitution themselves had intended, sometimes to a somewhat ridiculous degree. Justice Tulzapurkar cited an example of a case involving a bus conductor who had been convicted of fraud for taking money from the passengers but not issuing tickets. He thought that the activist judges at the court went too far by rewarding the conductor and giving him back-pay and damages. The consistent pro-tenant and pro-labour positions in landlord-tenant and labour-management cases of some judges at the time of these interviews are reminiscent of the pro-liberal and feminist stances taken by some judges today. This activist character at the court seems to have become more manifest with the passage of time because the conversations reveal a difference between the character of old judges and the new, with the former criticising the latter for their ideology. Justice Hidayatullah said that judges were now “asking themselves what the right thing to do was, not what could be legally done in a case”. Many such remarks, scattered throughout the book have only become more relevant with time. Another interesting insight that the book offers is about the criteria for the selection of judges for the Supreme Court. Apparently in addition to seniority and merit, the ideological leanings of the judges, their family backgrounds, their suitability to the diversity quota in the SC, and their personal habits were also taken into account while considering their elevation. Justice M.N. Chandurkar for example, was blackballed by the then prime minister Indira Gandhi from promotion only because of his attending the funeral of the RSS leader M.S. Golwalkar. The family background of a person was important too and coming from a well-known legal family was definitely taken into account in their favour. Justice Sarkaria is said to have made the point that “several persons had become judges because of their fathers, and that the son of a judge had a big advantage in these matters”. Many such interesting and telling anecdotes are to be found throughout the book. But rather than being seen as a simple mass of anecdotes and an account of conversations that Gadbois had with the SC judges, this book can be read as a legal history of post-independence India. The conversations on which the book is based might be from the 80s but through the aid of author’s commentary and even otherwise, the book itself stretches all across time to the present day. It fills a much needed gap for books that common people with little understanding of law can read to understand how the judicial system in our country is structured and what possible drawbacks such a system can throw up. This book will definitely raise public awareness around crucial matters such as increasing transparency in the judicial structures and processes in our country. For all these reasons, this book is a great addition to the public conversation, and a recommended read.